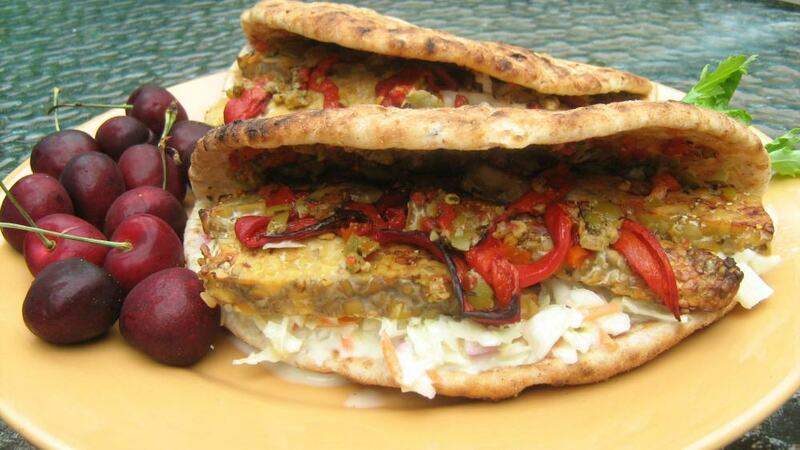 Tempeh Tantrum is the affectionate name of this sandwich! Despite the name it it really a great sandwich. It does take some prep work to pull it all together but if you are just having fun in the kitchen and want to try this delicious sandwich it is well worth all the work! Tempeh is often called Javanese "meat" because it is so popular in the Southeast Asian part of the world. It has been used for hundreds of years and is pretty much a staple. Tempeh is made from soy and is slightly fermented and formed into cakes. It is very dense so it is easy to slice or crumble, depending on the recipe. Although it is soy based, much of the commercial tempeh available today comes with the addition of a variety of other grains like barley. Tempeh has a rich nut-like flavor and can be used in sandwiches like this one or another favorite of ours, the Tempeh Reuben. It can be crumbled into stir fries or baked, steamed, fried and just about any other way you want to cook it! This particular sandwich was created as our entry into the Mezzetta sandwich contest and although it didn't win we still list the Tempeh Tantrum among our favorites. So treat yourself - take the time to make this great sandwich and enjoy! Oh, by the way, it isn't quite the same if you skip the slaw so be sure to make that as well! You'll be glad you did. and mix well. Cover and chill. Place in a small bowl and add the remiaining ingredients. Mix well to combine. Cover and chill. then cut into 1/4 inch strips, lengthwise. Place in a shallow dish and cover with the remaining ingredients. peppers in a single layer on a baking sheet. Place under the broiler for 5 minutes. Turn and broil another 3 minutes. spoon place 2-3 heaping tablespoons of coleslaw over one half of the flat bread. Spread the other half with the olive tapenade. and fold the flat bread in half. Serve with a cold drink and cool cucumber slices or fresh fruit. Total prep time for all components: about 50 minutes.